RIO DE JANEIRO, Nov 15 2012 (IPS) - Aluminium, opposed by environmentalists mainly because of the amount of energy needed to produce it, is one of the targets of the heated campaign against hydroelectric dams in Brazil’s Amazon jungle region. But production of aluminium is helping to drive industrial development in the Northeast, Brazil’s poorest region, Adjarma Azevedo, the president of the Brazilian Aluminium Association (ABAL), which represents the industry, told IPS. 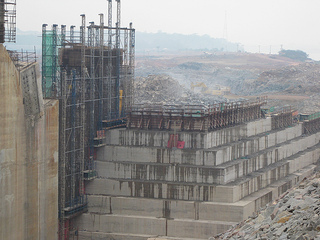 Because energy is the biggest input, growth of the industry is fuelling the construction of large hydropower complexes in this country, which are touted as a renewable energy source but opposed by environmental and indigenous rights activists. Aluminium is also the product with the highest recycling rate in Brazil, said Azevedo. The growing use of aluminium facilitates faster construction and saves on transport fuel because aluminium weighs less than other products. Consumption of aluminium in Brazil is growing faster than the economy in general, and it is driving demand for low-cost energy, in order to meet domestic needs with nationally produced aluminium. ABAL estimates that the domestic market will grow at an average of 7.2 percent a year up to 2025, despite the fact that aluminium is a product sensitive to swings in trade. In 2009, the use of aluminium fell 10 percent due to the global economic crisis. But demand rallied the following year, when it climbed 31 percent. And it continued to grow, by 8.2 percent, in 2011. But it has stagnated once again this year. The fast growth of activities and products that use abundant aluminium, such as the construction, packaging and automotive industries, explain the optimistic projections, Azevedo said. The rise in wages and incomes among working- and middle-class families in Brazil in the last few years has led to a boom in housing renovation and improvements, which has increased demand for construction materials. Demand for aluminium has also been driven up by the works required for holding the 2014 world football cup in 12 Brazilian cities, and the 2016 Olympic Games in Rio de Janeiro. At the same time, the government has adopted rules establishing that new cars must reduce emissions – an environmental goal that will require new technologies, as well as lighter-weight elements made of aluminium, the president of ABAL said. But domestic production of the metal is unlikely to keep up with demand if the cost of electricity in Brazil remains one of the highest in the world: it currently represents more than one-third of the cost of production of primary aluminium. In September, the centre-left government of Dilma Rousseff proposed measures to reduce the cost of electricity, including tax cuts and an extension of concessions for the generation, transmission and distribution of electric power, which would expire between 2015 and 2017. The main objective is to bolster the competitiveness of industry in general, to prevent the premature and irreversible shrinking of the manufacturing sector in the face of the sharp increase in production costs in recent years. According to ABAL, however, the measures fall short and are vulnerable, because they depend on approval by Congress, where the government bill has already been bombarded with 431 proposals for amendments. “With the megawatt-hour at 35 dollars, it is possible to maintain aluminium production at the current levels. But if the price dropped, it would stimulate new investments to expand production,” Azevedo said. The average global cost of electricity stands at around 40 dollars per megawatt-hour. But the average goes down to 27 dollars if China – where electricity is subsidised – is excluded from the estimate. Businesses in Brazil complain that they have paid up to 60 dollars per megawatt-hour. The aluminium industry is seeking to cut costs by generating its own electricity. To do that, the industry has become the main partner, for example, in the Estreito hydroelectric dam on the Tocantins River in central Brazil, with a potential of 1,087 MW. In Tocantins, some 500 km downstream, the enormous Tucuruí dam was built 28 years earlier, with a capacity to generate 8,370 MW, much of which is used by aluminium mining and industrial complexes. Activists accuse the industry of promoting the construction of the Tucuruí dam to obtain energy at subsidised prices, with no regard to its negative social and environmental impacts. For example, the reservoir flooded nearly 3,000 square kilometres of land, mainly forested, and displaced tens of thousands of people who lived in the area. Azevedo, who previously presided over the Brazilian branch of the U.S.-based ALCOA, one of the companies that supposedly benefited from the dam, sees things in a different light. Brazil was suffering from the effects of the sharp rise in oil prices after 1973, and needed abundant energy to carry out its ambitious economic development plan and replace expensive imported oil. Tucuruí offered a solution, Azevedo said, and Japanese investors and transnational companies likeAlcoa were invited to develop large-scale projects to mine bauxite and convert it into alumina and aluminium. The companies thus served as “anchors that fixed energy in the region,” where the small scale of the economy and the sparse local population did not generate enough demand for such a large hydroelectric dam, he said. But Azevedo added that “it wasn’t a good location,” because it was far from the main consumer markets, in an area without roads, infrastructure, skilled workers, or suppliers of services. Nevertheless, the companies accepted the challenge, making Tucuruí feasible, and training suppliers and local workers, he added. To offset the costs, the government offered a 10 percent discount for 20 years in the contracts to supply extra-high voltage electricity, after the first 230 kilowatts. But, he insisted, it was not a subsidy. Alcoa also partnered with two other transnationals, BHP Billiton and Rio Tinto Alcan, to build the Alumar industrial complex and produce alumina and primary aluminium in São Luis, capital of the northeastern state of Maranhão, 980 km east of Tucuruí. It would have been better to set up shop closer by, thus avoiding long-distance power transmission as well as the transportation of raw materials over nearly 2,000 km, said João Meirelles, director of the non-governmental Peabirú Institute, based in Belém, the capital of the northern state of Pará. Aluminium is a logical product to exploit in the eastern Amazon jungle, especially in Pará, where enormous deposits of bauxite are concentrated along with rivers with hydropower potential, Meirelles told IPS, differing from his fellow environmentalists by defending this development option. Aluminium is “a material of the future” and “the most reusable product,” he argued. Meirelles acknowledged the environmental and social damage caused by industrial undertakings that exploit natural resources in the Amazon region. But he believes it is possible to mitigate the damage, as Alcoa is attempting to do at its new bauxite mine in Juruti, in the state of Pará. And he put the damage caused in perspective, saying cattle ranching is the main culprit to be fought to curb deforestation. He also advocated new forms of negotiating compensation for the impacts of major works like hydroelectric dams, mines and roads. It is necessary to fight “for strategic goals” such as an end to deforestation in the rainforest, instead of merely limiting demands to solutions for local problems, like getting hospitals built or sanitation systems expanded in towns and cities affected by the projects, which are questions that should be addressed by the government, he said.